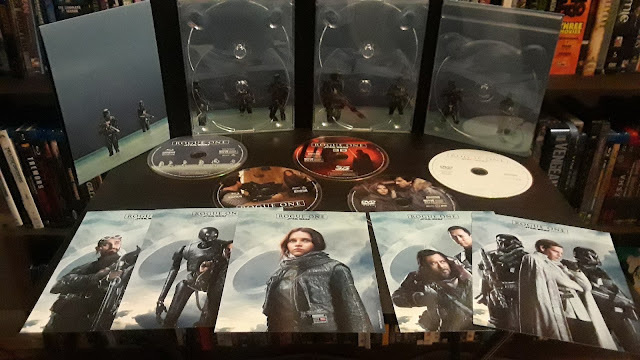 Every year we get some very unique blu-ray packagings. Some blu-rays come in steelbooks, while others come in digibooks. There is no shortage of different packagings especially if you are region-free. If you are, you might be able to get your favorite blu-ray as a mediabook, steelbook, digipack in other countries, while that blu-ray may have just gotten a standard release here in the states. So here are my favorite blu-ray packagings for 2017. Each of these Limited Editions comes with a sort of paperback booklet that contains interviews, essays, and other writings about the film and its filmmakers. 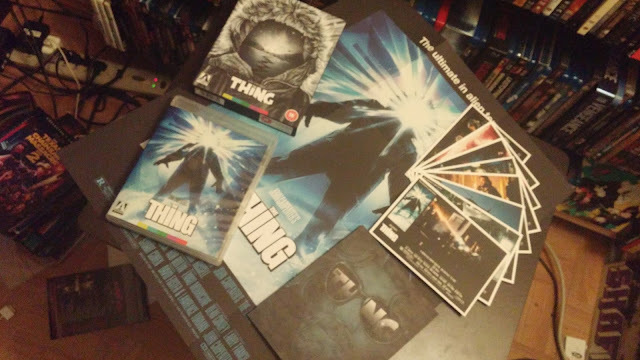 The Bird with the Crystal Plumage, Donnie Darko, and The Thing came with double sided posters containing the newly commissioned artwork on one side and the film's original theatrical poster on the reverse side. 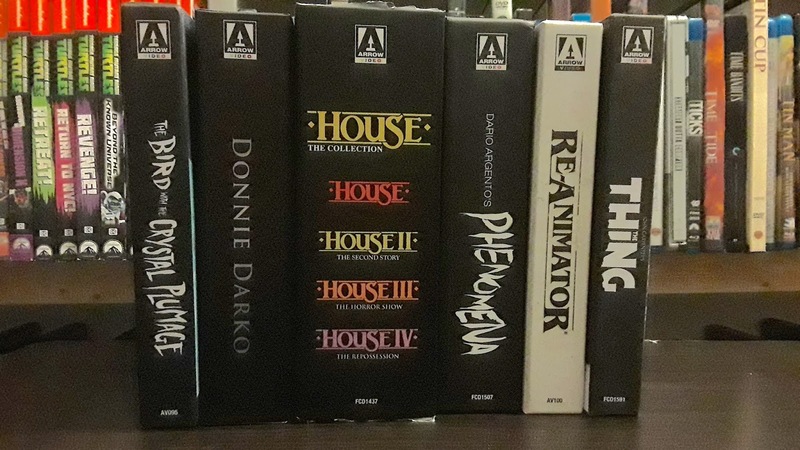 Donnie Darko and the House Collections came with hardbound books featuring new writings on the films as well as original press kits, and much more. 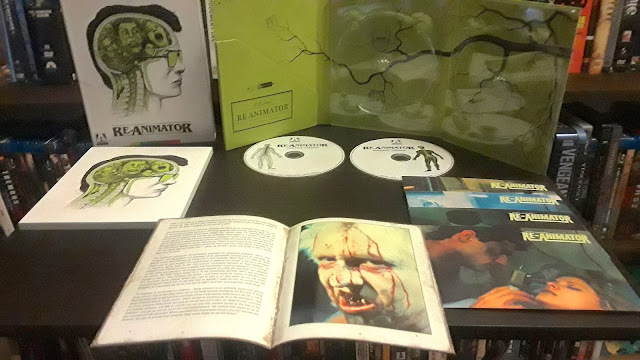 Re-Animator came with the same sort of paperback booklet, this time featuring a recreation of the comic book adaptation of the film from 1991 as well as a booklet containing essays about the film. Bottom line: Arrow had the best packaging out of all of the companies releasing on blu-ray. They were the most consistent and they went out of their way to make sure that their Limited Editions stood out from the rest of the competition. 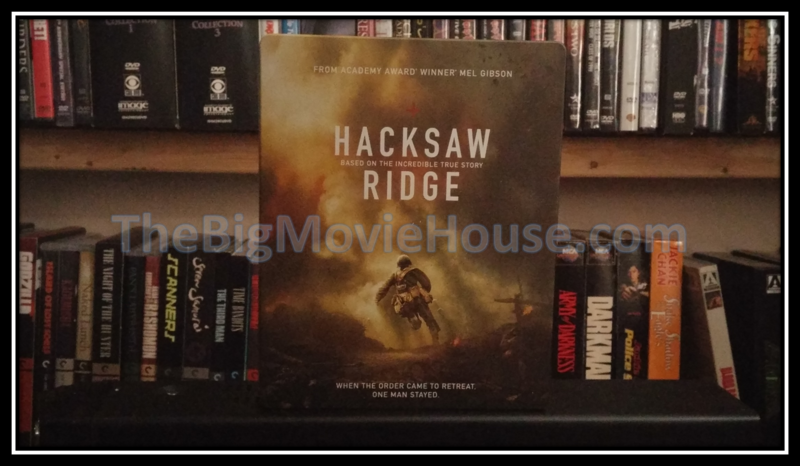 Hacksaw Ridge was a film that came out of nowhere. Everyone thought that because of the film's subject matter, that of a soldier who refuses to even touch a gun during wartime due to his religious beliefs, the film would turn into a preachy sermon from the film's director Mel Gibson. What Gibson gave us was a war film that gave us hope that in the middle of some of the ugliest battles during World War II that there might be someone out there who would put your life before their because they are being protected by God. It is a powerful film that doesn't talk down to those who don't believe while not put the believers on a pedestal. 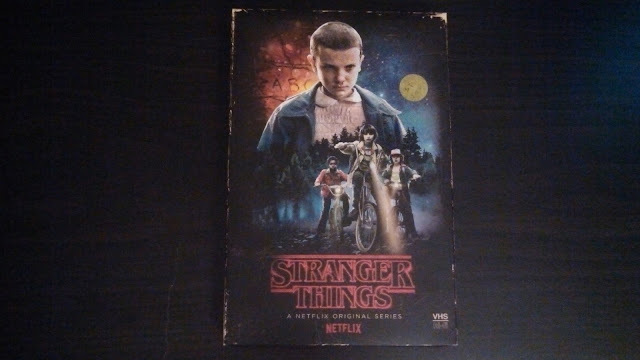 The steelbook (available only at Target in the U.S.) is a wonder to behold. Lionsgate was smart to use the film's theatrical poster instead of going the big head route. The goldish brown shines on the steelbook and makes the film all the more real because of it. I had my reservations about this release, but once I held it in my hands, I knew that I needed it in my collection. 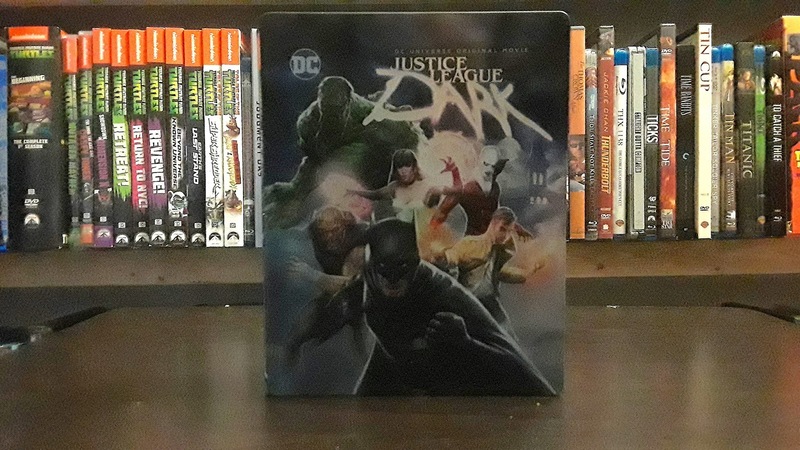 Justice League Dark is the second R-rated film from DC animation and it deserves it. The film deals with some very dark material and does it with a grace that The Killing Joke could only dream of having. It is also nice to get away from the popular characters and focus on some of the lesser known characters, although the filmmakers must have thought that people wouldn't want to see a DC film without Batman and thus he is put in here for no reason other than he is Batman. The steelbook packaging (again, available at Target in the U.S.) is very nice. There is no embossing, just a flat image, but it looks good in the hands so it had to be in the collection. Logan was one of the best films of 2017 and the best should get the best. Fox, distributors of Logan, went all out and gave us a ton of special features including a version of the film that is in black and white titled Logan Noir. They also gave us a beautiful digibook made exclusively for the big box store Target. This digibook is a sight to behold. 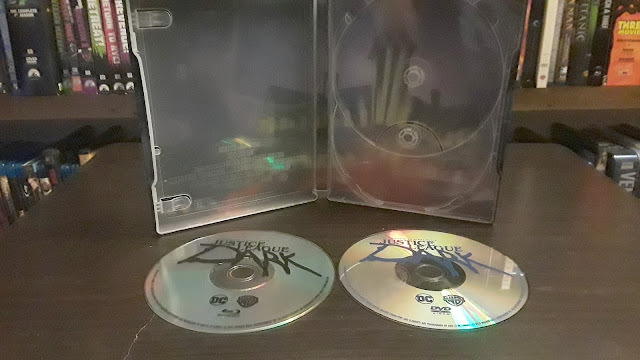 The slip sleeve that covers the digibook is very similar to the one found on the regular release. Inside the digibook has a gorgeous matte finish to it that you don't have to worry about getting fingerprints on. Inside are plenty of pictures from the film in stunning black and white. On the inside covers, you will find cut outs for the discs. These are not plastic trays like the digibooks from Warner Brothers or Sony use, but the type that Fox uses on all of their digibooks. 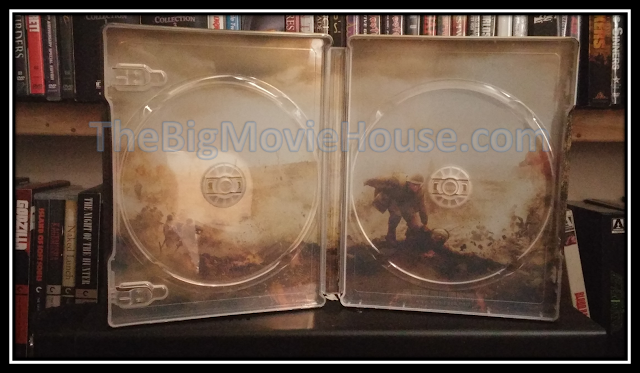 The Logan Noir disc comes inside of a cardboard disc holder that has a nice picture on the front including the title. This is one of the best digibooks Fox has ever released and has no problem finding a place on this list. 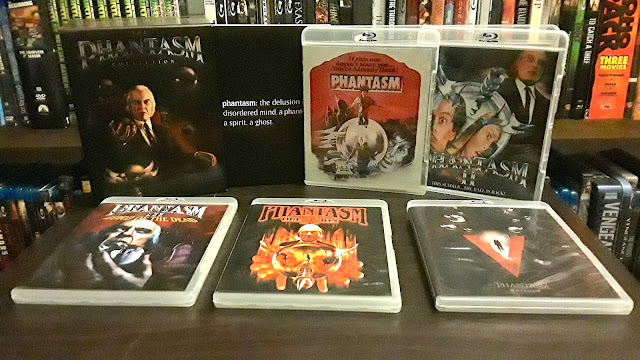 The Phantasm series has been one of the most problematic series of all time when it comes to home video releases. Sure, the VHS releases were easy to come by when they were first released, but even those were hard to find after a while. The director and creator of the series, Don Coscarelli, owned the rights to all of the films in the series except for the second one, which is owned by Universal. 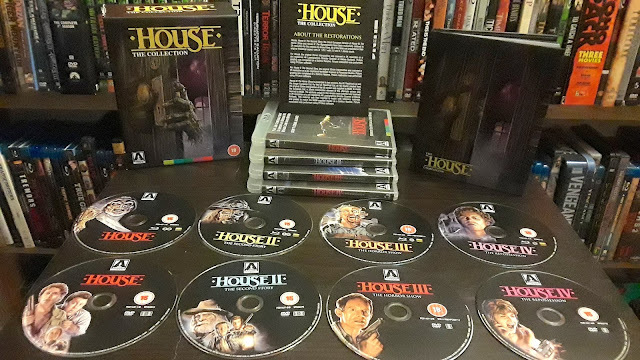 Because of this, it seemed that we would never see a complete box set. Then, in 2015, it was announced that the final film, Phantasm Ravager, would be hitting blu-ray sometime in 2016, along with a box set containing all five films. Fans went crazy with even the thought that all of the films could be placed inside the same set as part two. In April of 2017, Well Go USA, a company known for releasing Asian films in the U.S. released The Phantasm Collection. 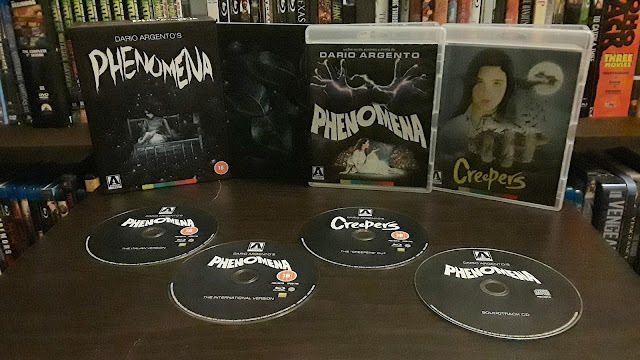 Containing all five films in the series, including the Scream Factory disc for Phantasm II, this collection is a dream for any fan of the series and proof that sets like this can happen. The set bundles together each of the films on their own discs and in their own blu-ray cases with the film's original poster art. Each film has been remastered and looks great. The first film even got a brand new 4K restoration from J.J. Abrams' company, Bad Robot. Also inside the box is a thick booklet that contains interviews with all of the heavy hitters from the first film. Rounding out the in the box features is a double-sided poster. The Phantasm Collection is one of the best box sets ever. Every film is treated with love and care, and even if you don't like one or all of the films, there is no denying that this is a supremely crafted set. 5. Bonus disc with additional featurettes. 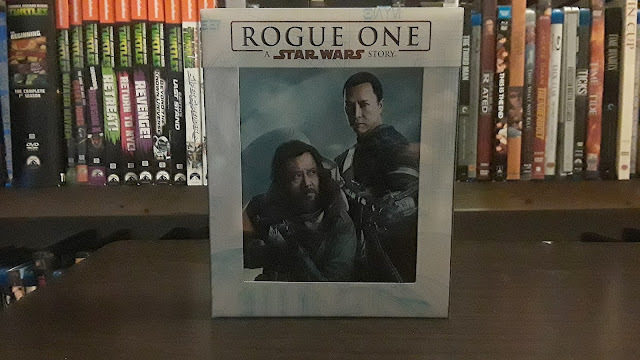 One thing that I do wish that Disney would do is to stay uniform with all of the releases of the other films, meaning that I wish that Disney had made this packaging to look more like the packaging for The Force Awakens 3D release. It is a shame that they don't look right sitting next to each other on the shelf. This is, of course, a small complaint as the packaging looks so nice that it can look different from the others. Stranger Things came out of, seemingly, nowhere when it was released on Netflix in 2016. The show became a monstrous hit, with everyone quoting lines and reliving the 80's all over again. I really like the show, may even love it, but I was not a part of the "Stranger Things fever" that swept the world by storm. I found the show to be smart and suspenseful and not reliant on CGI trickery. The thought of the show ever hitting the home video market seemed like a pipedream. Netflix made, in no uncertain terms, that they would never release any of their original content on dvd or blu-ray because it would take away from their subscription base. They wanted the only way to see the show be through their site. It was only after high-quality bootlegs started showing up all over the world that Netflix went back on their word and decided to release the first season of the series on blu-ray, exclusively through Target. 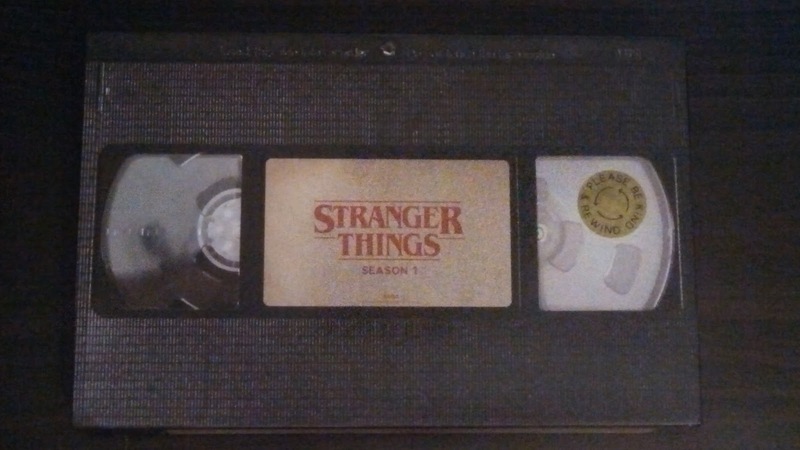 The packaging is meant to resemble a VHS. The box is oversized and very sturdy. The cover acts as a slip sleeve and inside is a box that resembles an actual VHS tape. It looks very real. Opening up the VHS, you will find two blu-rays and a poster. Below the blu-ray tray is a tray that houses the dvds. There are no special features to speak of, but the packaging is so beautiful that it doesn't matter. Netflix did a great thing by releasing the series on blu-ray and dvd (and later UHD) and I hope that they continue to do so as long as the series is current. For years, fans have patiently waited for Synapse to release Suspiria on blu-ray. 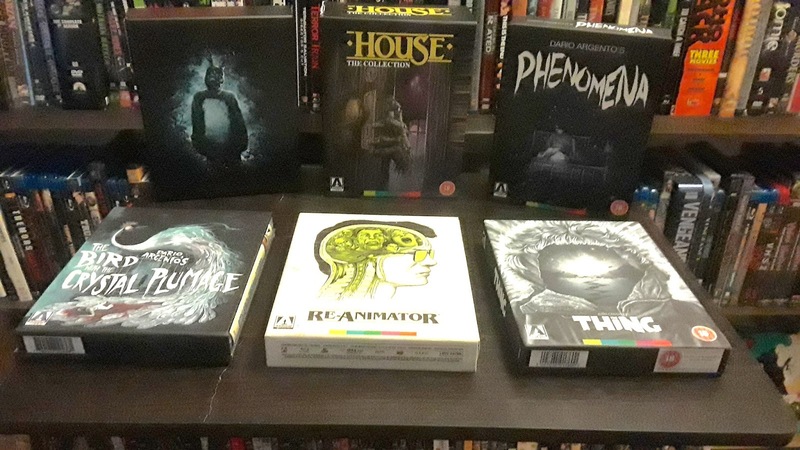 Synapse are not slouches and they took their time (years) to make sure that they were releasing the best version of the film on blu-ray and they did not disappoint. 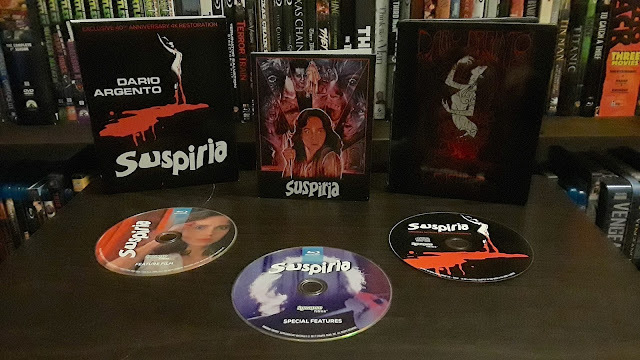 In fact, Suspiria is the only blu-ray that I have reviewed that got 10's all the way through. 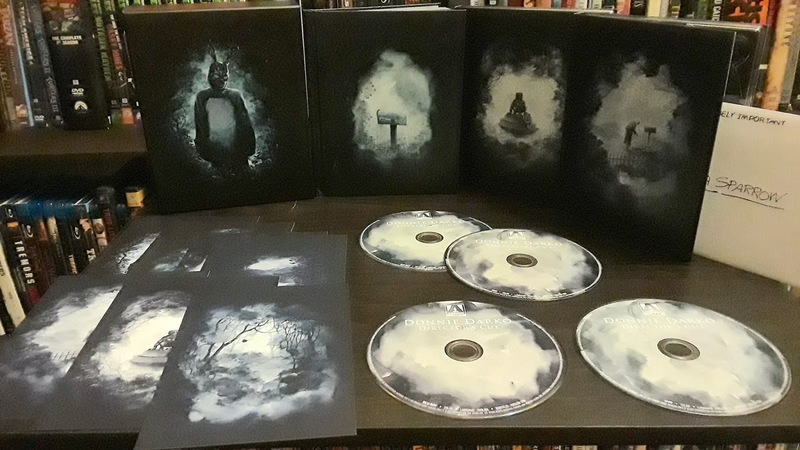 Synapse released the film in a limited edition steelbook and it is a wonder to behold. 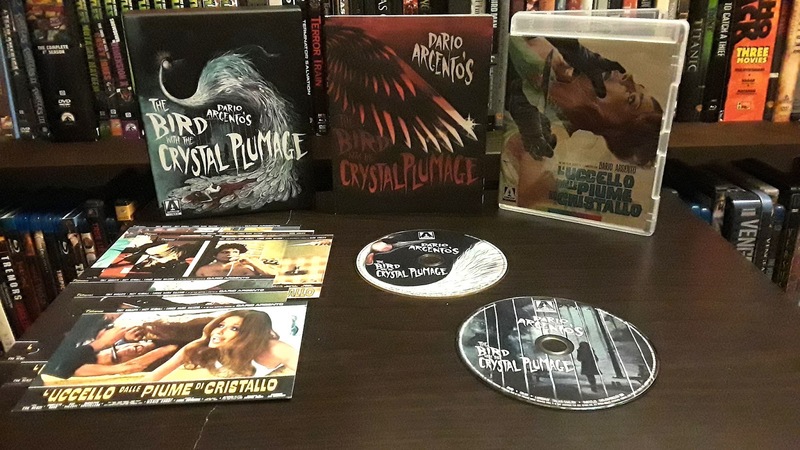 The slip features the film's original art while the steelbook features artwork from Malleus, Van Orton Design, Juan José Saldarriaga & Chris MacGibbon and they have done a fantastic job here. Each piece of artwork is perfect for this release. The steelbook feels good in the hands and looks magnificent on the shelf. This is THE release of the year. So there are my favorite packagings of the year. 2018 looks to be a great year with some of the blu-rays that have been announced already.